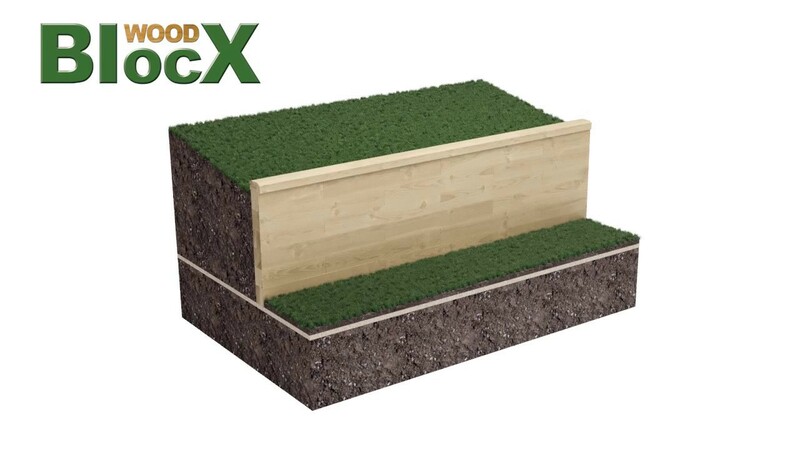 WoodBlocX™ garden retaining walls are the natural and beautiful choice for landscaping your garden with everything you need supplied directly to your door meaning there are no hidden costs and no need for foundations or substantial groundworks. The BlocX™ themselves are light and easy to handle and building requires no heavy lifting. Orders can be delivered within 2-3 days of purchase and in most cases it is possible to order on Tuesday and build your project over the following weekend. The beauty of a WoodBlocX™ wall block system is that it can be adapted to suit any size of project, far cheaper than stone, brick or gabion walls and better quality than all other other timber products on the market. Our design team can also add in unique features including steps, planters or even a pond and this service is completely free of charge. Our retaining walls can be built on flat or sloping surfaces and the timber used is sustainably sourced from here in the Highlands of Scotland. Each BlocX™ is created and pressure treated at our family owned sawmill where our manufacturing team ensure the quality of every component before dispatch. WoodBlocX™ are joined using our patented dowels meaning no need for nails, screws or power tools and even if you make a mistake or want to change your design it is not a problem. Structures can be taken apart and rebuilt at any stage with minimal effort. 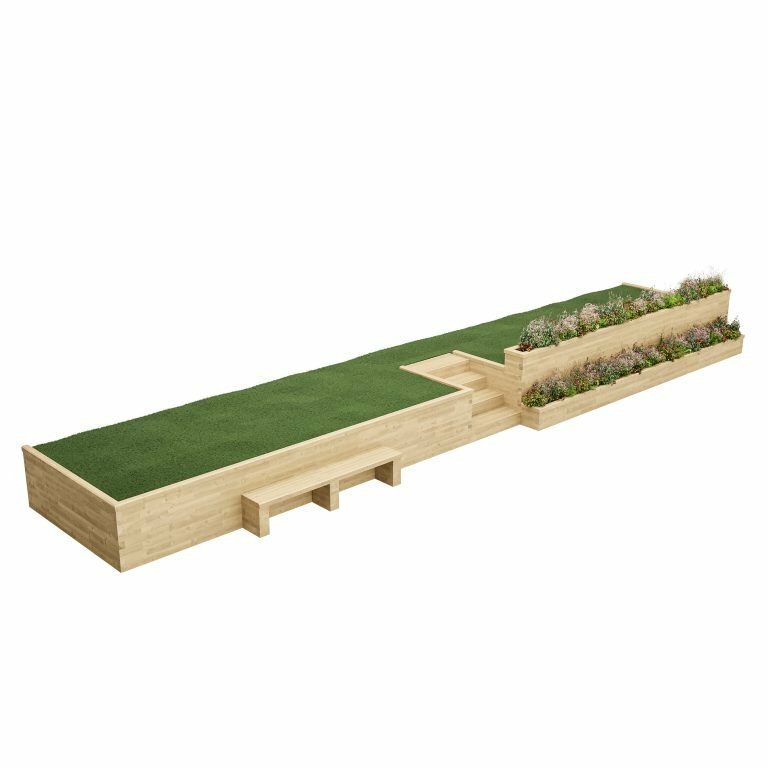 A WoodBlocX™ retaining wall can be expected to last for at least 15 years and can be built up to 1 meter high in a single span and many structures have been built higher using terraces. If you are thinking about building a retaining wall in a garden. WoodBlocX™ wall blocks could be the solution you have been looking for. If you require a set of steps in your wall fill out our simple form HERE and our design team will get a design together for you within hours. Ordering a wall from the calculator below is as simple as choosing the lengths for your wall and then a height and adding it to your cart. This calculator allows you to choose any size so you should be able to get exactly to the size or shape specific to your needs. Any sizes on this calculator can be built up to 1m high. Simple and fun! If you would like to order more sizes just add the quantities to your cart then come back and add another. The order will then be processed and with you within 2-3 days. When you receive your BlocX™ you will also get detailed layer by layer instructions. If you require a more complex design than our calculator will allow please don't hesitate to contact our team for a free design. We usually have bespoke design back to you within 24 hours. You can also Browse our popular pre-designed kits HERE. If there is anything at all we can help you with regarding WoodBlocX™ call us today on 0800 389 1420 for a chat or simply fill in out contact form HERE. Like giant kids building blocks our system is easy, quick and fun to build with. Product is fantastic but the delivery service was poor. Dumping a heavy pallet on the pavement is not an acceptable fulfillment solution. When ordering on line one is only told that this might occur AFTER one has placed one's order. As it happens we had builders in the house at the time who offered to carry the delivery through to the garden; had they not been with us we would have found it difficult to cope with the delivery as we are both old and have difficulty carrying heavy items. Great design and easy to construct. Easy to use and excellent results! I purchased a retaining wall, the website was easy to use and delivery was made on the date as requested, all the staff were very helpful. The build was really simple and took no time at all. Overall I am very pleased with the finished result, the wall is very sturdy and does its job perfectly and is a great feature point in my new garden! Thanks! 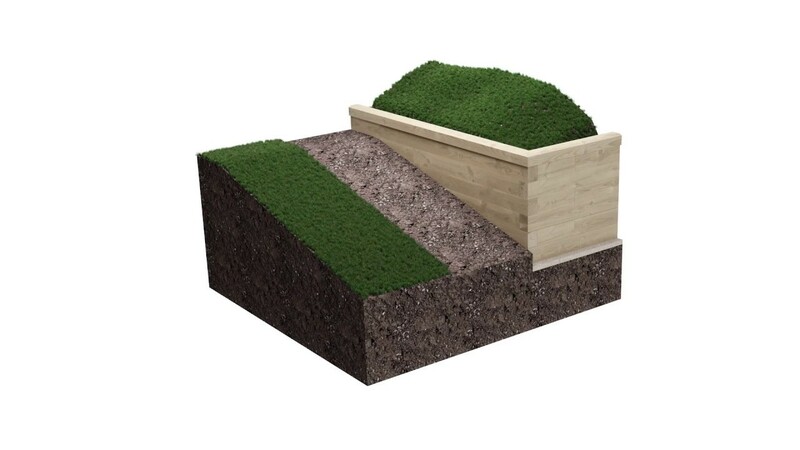 Very strong structure and great design, does its job at retaining the soil perfectly and the added bonus of looking great in the garden tops it all off! I am very pleased! I would recomend, however block colour/presentation is not as clean looking as web site photos. Easy to use and well thought through idea. Very easy to build even though I had some different parts contrary to the design plan recieved. Fortunately I was able to modify a part and spread the plates out to build the wall. As it is only a low wall I am content it will do the job. Aside from that it looks amazing. we appreciate all feedback we are sorry to hear for the error, we would have rectified this by resending the correct parts happy to hear you found a solution our design team is always on hand for any questions. Came when they said it would, went together as they said it would. What more can you ask for? Delivered when they said, and, if it lasts as long as a previous purchase from them it'll still be doing its job in 25 years time. Good decorative product. Does the job I wanted and it looks good. Excellent service, fast replies to queries. Excellent product, easy to assemble. I have used WoodBlocx for two garden projects now and have been very pleased with the product and finished look. I have unreservedly recommended WoodBlocx to friends and family who have similar projects in mind. Well designed product, easy to follow instructions and professional finish. Behind the product was the helpful design aspect of the service too. Thank you for the feedback! Glad you are happy with our product! Although I only needed a small corner to hold back a border so that I could site a pressure filter for my pond the result is solid and excellent. Thank you WoodBlocX excellent product. Solid easy to assemble and arrived quickly. Thank you! Superb we are so pleased you are happy with your WoodBlocX and customer service too, thank you. Great service and great product, easy to assemble, even when you get it wrong you can easily dismantle and put it right and I am a 63 year old girl. Brilliant! Thank you for your feedback. The hardest part about building with wood blocx is digging where you want it go! Once you get started and follow the instructions it's a breeze! I was a bit sceptical at first about taking the plunge and buying them when I hadn't seen first hand what I was buying! But after finishing my retaining wall I couldn't be happier! Brilliant! Thank you so much for your kind feedback. We are proud of our product and it's ease of use. As I've already said - all excellent! Superb, glad we could help! Fantastic product - love it. A beautiful product and excellent service. Don't hesitate as you will not regret the purchase. IHighly recommended. I got great advice and help to make sure I bought the perfect product for my garden. Thank you for your kind feedback! We're really glad to hear how much you liked your WoodBlocX! Good service, great product - let down by mediocre delivery service. Good advice regarding the planning of a retaining wall. Prompt action when I realised that some of the order had not been delivered. Significant delays by Parcelforce, the delivery service. Delivery takes just 4 working days. If you are in a hurry for your BlocX please call us and, if we can, we will try and speed up delivery for you. Delivery is on a day you select (at checkout) between 9am and 5pm Mon - Fri (except Bank Holidays). Saturday delivery is available at extra cost of £40, select this at the checkout if it’s required. Unfortunately on some occasions deliveries can be delayed due to circumstances out of our control. We would advise choosing a suitable delivery date a few days prior to the date you wish to start your build, just in case. When we despatch your order we will send you full tracking details for your pallet so that you can contact the delivery company and find the location of your BlocX. The pallet does not have to be signed for and we can arrange for it to be left at a secure location at your property if you are not in at the time of delivery. WoodBlocX is an ideal solution for any scale of commercial project. Our components are covered by our warranty for 15 years and we can offer design calculations for any retaining wall up to 1m in height. New housebuilders and Landscape architects can specify WoodBlocX in the knowledge that our system will match the most exacting standards. If you are looking to use WoodBlocX on a commercial project then please get in touch with our technical team on 0800 389 1420 where we can provide design calculations and bespoke details. Enter the height directly or use the slider to adjust by BlocX size increments of 100mm/0.1m. Different heights have different benefits for your raised bed. *Free UK mainland shipping on orders over £500. Delivery is on a day you select (at checkout) between 9am and 5pm Mon - Fri (except Bank Holidays). Saturday delivery is available at extra cost of £50. Prompt and efficient service, easy to assemble and looks smart. Quality control poor - one block was incorrectly drilled so had to request a replacement which took 4 days to arrive, then tried to finish the build only to find one of the cappings was the wrong length, so had to wait another 4 days for that to be replacement even though I was told it would arrive earlier. 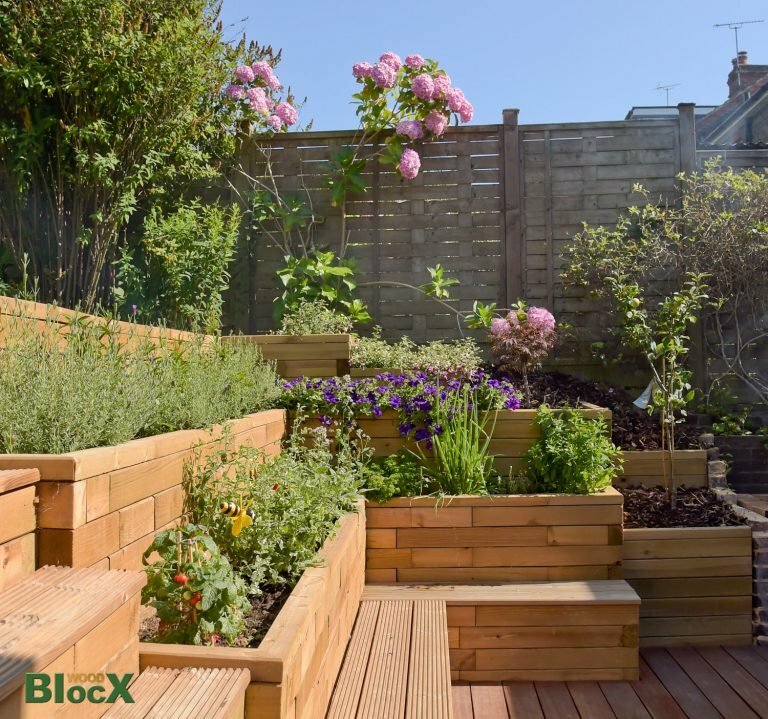 WoodBlocX is so versatile that you can use it to build walls on flat level gardens or equally on sloped or steep gardens. Its equally easy to build the bottom layer up a bank or on a flat surface. Our team of designers can help you find a solution for any crumbling or unmanageable bank in your garden. The WoodBlocX system is a great alternative to log retaining walls as it does not require a concrete foundation. WoodBlocX walls and steps can be designed by our team to fit your exact space and needs. We have a team of designers waiting for your pictures and sizes. With your guidance, they will then put together a design for you based on years of garden design experience. Our team can help you design any shape or size structure that you feel would fit your space and needs best. With WoodBlocX you are not limited to straight walls as we can design curves, circles or ovals of nearly any radius to suit your garden. Once a retaining wall design has been agreed we will do the rest for you. We will work out the components then put together a full layer by layer instruction pack for your build. The components will be delivered to your location. We try and make every step along the way as easy as possible. All that's left to do then is get a level surface and the fun part of knocking the BlocX together. Find out more and see some of the projects we have helped with here. Why not just use railway sleepers, stone or boards? - Sleepers need a foundation or footing to sit on, concrete is messy, hard work and expensive. - They are also incredibly heavy and difficult to work with, and often expensive to buy. Its also difficult t cut them to your exact angles or sizes without heavy landscaping machinery. - Stone or blockwork is expensive and requires mortar and foundations, as well as the skills to build with it successfully. WoodBlocX is also comparably cheaper than bricks. All wooden components are made from high-quality timber. We do not use the heart of the tree, which is weaker. The wood is pressure-treated and because WoodBlocX are pre-drilled, the treatment penetrates almost 100% of the wood. WoodBlocX will last at least 15 years if installed using our guidelines, but they are expected to last even longer. WoodBlocX has more strength than masonry in some situations because it can withstand tension forces as well as compression. It will not crack with ground movement or frost. WoodBlocX is put together with many joints and each dowel can withstand 0.9 tonnes of sheer force. The structure forms a single solid unit that will not easily distort like many other flimsy timber products on the market. WoodBlocX are so light even a child could help with construction. There is no heavy lifting involved in a WoodBlocX build, and all the parts fit into an average-sized car. There’s also no need for foundations or cement, and they can be sited on any surface – soil, grass, tarmac, concrete, paving – including slopes. The rough-sawn wood is attractive in itself, and needs no varnishing. It will naturally fade to a grey over the years. If you want to, you could also paint them. Any water-based exterior paint will do it, so choose a colour you like which will fit in with the rest of your garden. No technical skills are needed to build a WoodBlocX structure. We will supply you with specific instructions for your build, and general assembly instructions. There’s also a video to help you. The BlocX go together quickly and easily, with no need for power tools or specialist equipment. We source the timber from sustainably-managed forests, and our treatment process involves no chemicals that might leach from the wood, unlike the heavily treated sleepers. The dowels are all made from recycled plastic too, and we continue to work hard to reduce our carbon footprint in everything that we do. A new garden design – or a new determination to transform the garden – can be a daunting prospect. Before you start, spend some time thinking about exactly what you want the garden for. Do you want purely ornamental planting, or productive areas as well? How much, if any, lawn do you want – do you need to supply a sports pitch or play area for the children? What about seating and entertaining areas and storage (where’s the lawnmower going to live?)? Then assess what you want against how much time you have to look after it, amend your plans as necessary, then it’s time to design your garden.